Have you ever been annoyed, that MS Project does not list you dates of predecessors in its task form? How do you quickly determine the driving predecessor? If you have many predecessors for a tasks, finding the driving task (without switching views…) can become pretty cumbersome. The solution: add a button to MS Project and run a macro that lists all unfinished predecessors along with its line number and finish date. No idea, how to use this code? Check out, how to add VBA code to your computer. 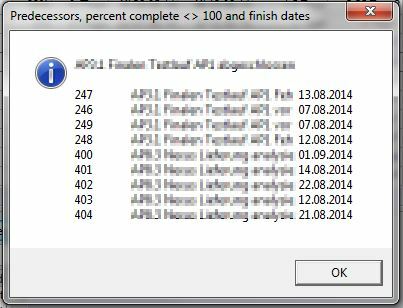 MsgBox msg, vbInformation, "Predecessors, percent complete <> 100 and finish dates"
This entry was posted in Project Management, Project tips and tagged project2003, project2010 on July 10, 2014 by Stefan Waldherr. Here is what the resulting files look like. Note that work, actual work and remaining work are displayed in days. The first column contains a field (text28) which I use in MS Project to assign tasks to projects. All tasks that finish in the current week are highlighted in red, all task that finish in the subsequent week are highlighted in yellow. If you run the macro twice in one week, you’ll first have to remove the files of the first run. Caveat: the macro works reliably only if there is at most one resource assigned to a task. swaFilename = swaPath + swaPrefix + "-" + CStr(Year(VBA.Date)) + "-" + strCalendarWeek + "-" + r.Name + ".xlsx"
' filename is swaPath + year + KW (leading zero) + Name + ".xlsx"
swaWorksheet.Cells(1, 2) = "Summary Task"
swaWorksheet.Cells(1, 7) = "Work [d]"
swaWorksheet.Cells(1, 8) = "Actual Work [d]"
swaWorksheet.Cells(1, 9) = "Remaining Work [d]"
'                        excelApp.ActiveSheet.ListObjects.Add(xlSrcRange, Range(swaRange), , xlYes).Name = "Tabelle3"
This entry was posted in Project Management, Project tips and tagged excel2010, project2010, vba on July 10, 2014 by Stefan Waldherr. I find myself often using a number of worksheets in a workbook and navigating through them is cumbersome. Googling for help, I found a a post on the office blogs where a simple macro would automagically create a table of contents (TOC) of all worksheets with hyperlink shortcuts. you can quickly jump back to your TOC with CTRL-G gg. The macro adds a shortcut to the TOC sheet, by naming cell A1 “gg”. Caveat: if you change the order of the tabs and run the macro again, you’ll have to change the order of column B manually. 'of pages to be printed for each sheet on the TOC sheet. This entry was posted in Excel tips and tagged excel2010, vba on June 26, 2014 by Stefan Waldherr. I want to ensure that all tasks in my project plan have certain custom fields sets (like team lead, contract id, deliverable, etc.). To spot the tasks that lack this information, I’ll highlight them in my Gantt view. a number greater zero if the quality check fails. Second step, add a flag, say flag20 to be true if the quality check fails (number19 is greater 0) or false otherwise. Third step, format the gant chart based on flag20. 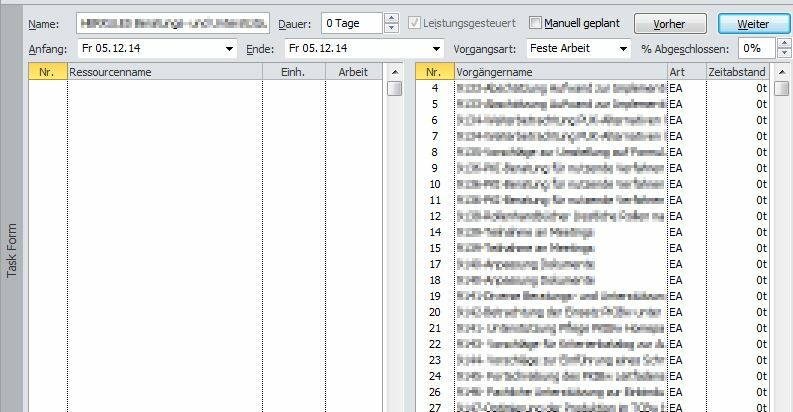 This entry was posted in Project tips and tagged project2003, project2010, vba on February 10, 2014 by Stefan Waldherr. Select all notes in Evernote for which you want to generate a tag cloud and export the data via File|Export|Export as a file in ENEX format to a folder on your hard drive, say c:\temp\Evernote.enex. Depending on your number of notes that file may be huge. Convert the exported file to something that only contains the tags. Convert the file with a command line utility from Microsoft (or any other XSL processor). Download msxsl.exe and save it to c:\temp. Download the XSL file which sets the conversion format and save it to c:\temp. Upload or copy/paste tagcloud.txt to a service that generates tag clouds. In a future post I will explain how to analyze your tag and possibly other meta data with Excel. This entry was posted in Misc and tagged evernote on October 9, 2013 by Stefan Waldherr. I’m a passionate golfer and one thing I’ve learned in +20 years of play is that – besides solid ball striking – it pays off to know the course in advance. Be prepared. Based on your skills and clubs you can develop a strategy for the course. For each hole, you estimate distances and check hazards and the way the green is defended with bunkers. Eventually, you document your findings in a yardage map for later use. What does all this have to do with project management, you ask? Well, this post is a first in a series of blog posts where I document my yardage map for projects – everything I need to successfully tackle projects in the IT industry. I’m currently employed both as a line manager and as a project manager for 7-figure contracts – teams of up to 30 employees. In the past, I’ve documented my tips and tricks in a number of places – files on my hard-drive, e-mails, and so forth. Over the years, this got too messy and I figured out this had to change. So why not publish my knowledge in a series of blog posts? My key idea is to list must-have or must-do items for each phase of a project for later reference. This blog is intended for project managers who look for practical tips and best practices. You will learn how to sharpen the scope of a project, create a proper project plan and even more importantly, how to automagically update the plan with minimal effort. An updated project plan is a key instrument for making sound decisions. For tracking projects, I use MS Excel and MS Project and you’ll learn a number of macros. For the impatient, check out the macro collection for MS Project or for Excel. The upcoming posts are structured along PMI’s process groups which roughly correspond to the phases of a project. Shall I take over the job as project manager or not? Use a project definition report to avoid failure. The basics – what do I need? How do I create a project plan? Check your plan with this best practices checklist. The weekly cycle – how do I update the plan each week? This post serves as a table-of-contents for future posts. Stay tuned for more to come. This entry was posted in Project Management on April 8, 2013 by Stefan Waldherr. This entry was posted in Excel tips, Project tips and tagged excel2003, project2003, vba on April 4, 2013 by Stefan Waldherr. This entry was posted in Excel tips and tagged excel2003, pivot, vba on April 1, 2013 by Stefan Waldherr. Not reflecting holidays in project plans can have many nasty side-effects. Tasks end later than you think because people are not available. If you have longer projects, the number of holiday days, bridging days and other nonworking time add up and can significantly extend your project far beyond your established deadline. This entry was posted in Project tips and tagged project2003, vba on March 29, 2013 by Stefan Waldherr. This entry was posted in Excel tips, Project tips and tagged excel2003, project2003, vba on March 28, 2013 by Stefan Waldherr.